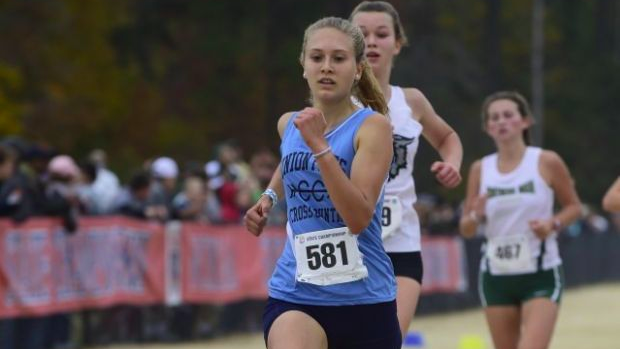 We are heartbroken to learn that Union Pines senior Samantha Davis passed away Saturday following a cross country race she ran in that morning. Davis was racing in the girls invitational race at Hare & Hounds at McAlpine Park less than 24 hours earlier in Charlotte. At around the 4K mark, we learned, Davis collapsed with a seizure before going into cardiac arrest. The medical team on site rushed to Davis as soon as it could, stabilizing Davis before rushing 10 miles north to Novant Presbyterian Medical Center. According to a report from The Southern Pines - The Pilot, Davis "suffered a softball-related injury earlier that same year, which resulted in seizures and a diagnosis of epilepsy. However, more recently, the teen had been seizure free." Davis was one month shy of her 18th birthday and ran cross country for Union Pines over the last four years, as well as indoor track and outdoor track. She was also a member of the Marching Band. Davis was a member of the Union Pines varsity team for the past two cross country seasons.